The California Midwinter International Exposition was held in San Francisco's Golden Gate Park from January to July, 1894. Planned and organized by local businessman Michel H. deYoung, the fair was constructed within an amazingly short period of 5 months, and covered 160 acres. 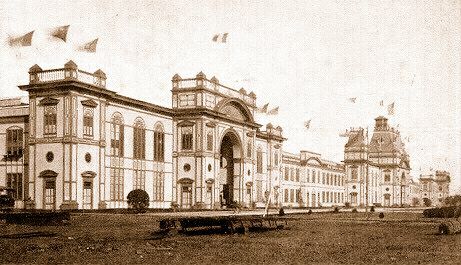 Many exhibits were obtained from the World's Columbian Exposition, which was held in Chicago the year before, and shipped to San Francisco to be displayed there. The Firth Wheel, a smaller version of Chicago's extremely popular Ferris Wheel, was erected in the Midway amusement area of the fair.....causing locals to quip: "It's not the Firth Wheel, it's the second wheel!" Numerous organizations staged parades and special events during the course of the exposition, which was highly attended by Californians. The Midwinter Fair, as it became popularly known, was a major success for the City of San Francisco. 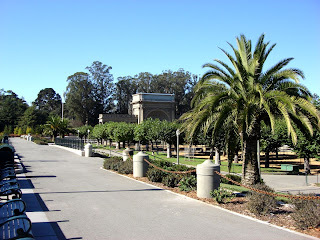 At the close of the fair, all of the structures were demolished, except for the Egyptian-style Fine Arts Building.....which became the predecessor of the deYoung Art Museum. Also preserved was the popular Japanese Village, soon to become a major attraction in Golden Gate Park.....the Japanese Tea Garden. 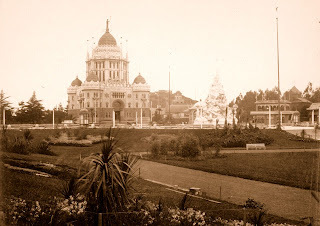 Below is an 1894 photo of the fair's Administration Building and California Allegorical Fountain.....contrasted with a 2008 photo taken from a similar viewpoint. The Spreckels Temple of Music now occupies the area where the fountain once stood.